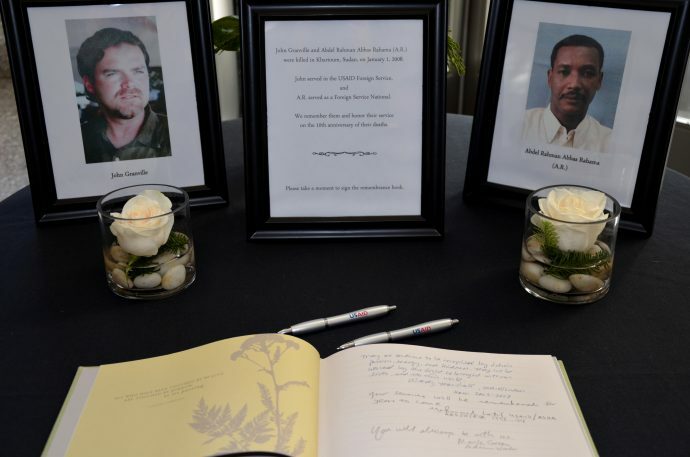 Ten years ago in Sudan, USAID Foreign Service Officer John Granville and Foreign Service National staff member Abdel Rahman Abbas Rahama, who went by “A.R.,” were murdered in Khartoum by four men who plotted an attack and targeted their vehicle. It was not the first time, and unfortunately not the last time, USAID staff have been killed in the line of duty while carrying out objectives to help end extreme poverty in the world and build resilient, democratic societies. In 2012, our colleague Ragaei Abdelfattah was killed in a bombing in Afghanistan, in which four other people also died. In 2016, our colleague Xulhaz Mannan was brutally murdered in Bangladesh. The losses we endure and the risks of working in some of the world’s most dangerous places do not deter us from our mission. As we bring 2017 to a close, we honor John and A.R. and all those working for USAID and our partner organizations who have lost their lives carrying out the work we dedicate our lives to—work we believe is essential for a just, humane and collaborative world. John Granville, who was killed at age 33, helped lead an effort in Sudan to distribute 50,000 wind-up, solar radios to people who had been isolated by decades of marginalization and war in what was then Southern Sudan. When the deadly 22-year north-south civil war ended in 2005, the radios helped citizens in the south exercise their rights and learn their responsibilities under a new governance arrangement resulting from the peace agreement. This simple source of independent information made a profound difference to those who would become citizens of the independent country of South Sudan several years later in 2011. A.R., who was 39 when he died, left behind a widow and young son. He started working with USAID four years earlier as one of the original members of the USAID Disaster Assistance Response Team for Darfur, where conflict that began in 2003 created one of the world’s most dire humanitarian crises. Despite the hope and jubilation of independence in July 2011, South Sudan has become the most deadly country in the world for aid workers. In Sudan, violence that erupted before and after South Sudan’s independence affected the Granville-Abbas Girls’ Secondary School in Kurmuk, Blue Nile state, which was dedicated in 2010 to honor John and A.R. and continue their legacy of assisting people in Sudan. The school accommodated 120 female students, but since 2011, the Sudanese military has occupied the school in response to conflict in the state, preventing it from being used for its intended purpose. That part of the world where John and A.R. worked continues to be a dangerous place for those responding to urgent humanitarian needs, trying to secure peace and stability, and helping spread democratic principles of transparency, inclusion and access to independent sources of information. But while the deaths of John and A.R. were sudden, shocking and tragic, they also sparked a legacy that continues to support and inspire USAID staff around the world. 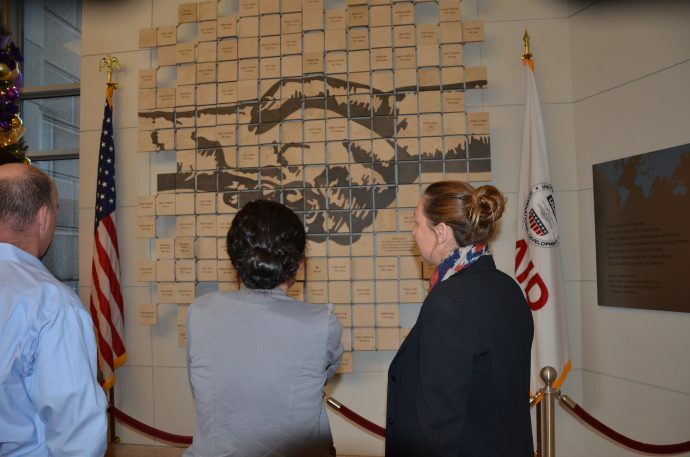 The Granville-Rahama Staff Care Award recognizes USAID employees who make significant contributions to the morale and well-being of USAID staff. And USAID’s Staff Care program has grown to incorporate many services to support USAID staff worldwide, including helping staff cope with and recover from high-threat and traumatic situations. We also hope that the Granville-Abbas Girls’ Secondary School will be returned to the community in Sudan, so that girls may again pursue their dreams and reach their potential there, continuing the legacy of John and A.R. The commitment to helping other people that John, A.R., Ragaei, Xulhaz and all our fallen colleagues showed daily continues to inspire us. They all represented the goodwill of the American people to other people around the world. We begin another year recommitted to the principles for which they paid the ultimate sacrifice. The Aid Worker Security Database has compiled statistics on violent incidents against aid workers since 1997. Andrea Freeman is deputy director of USAID’s Office of Sudan and South Sudan Programs, where she has worked since 2005. She worked with John Granville and Abdel Rahman Abbas Rahama. Angela Stephens is a communications adviser in USAID’s Office of Sudan and South Sudan Programs, where she has worked since 2009.